It’s that time of year when the acorns fall and the fall projects are in full swing! 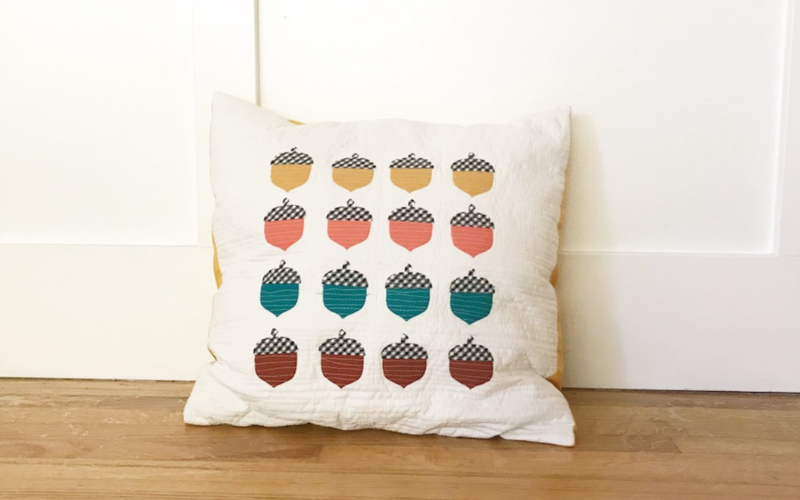 Learn how to make this patterned acorn pillow cover by following along with the tutorial below! 1. 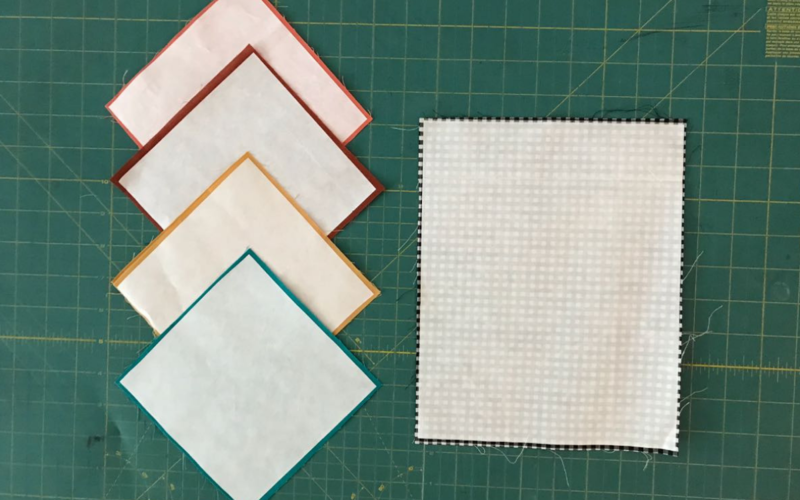 Cut four pieces of fusible fabric stabilizer that measure 4.75 inches by 4.75 inches and iron the pieces to the back of your 5-inch squares of fabric. 2. 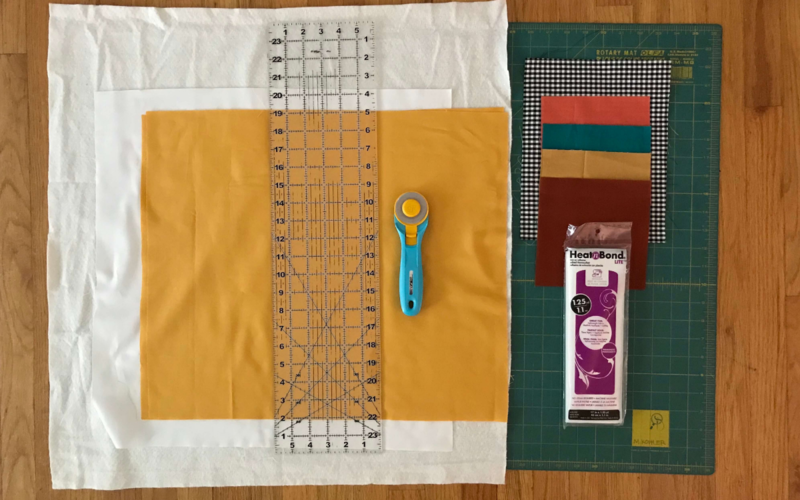 Cut one piece of fusible fabric stabilizer 7.75 inches by 9.75 inches and iron it to the back of your 8-inch-by-10-inch rectangle. 3. When ironing the fusible fabric stabilizer, follow the manufacturers’ directions on the packaging. Leave the paper backing on. 1. Open the acorn design (Design ID# 23072) in Silhouette Studio®. Select the design, right-click, and choose Ungroup. Delete the crosshatch shapes. 2. Move the acorn top off of the cutting mat to the holding area. Move the acorn bottom to the top left of the cutting mat. 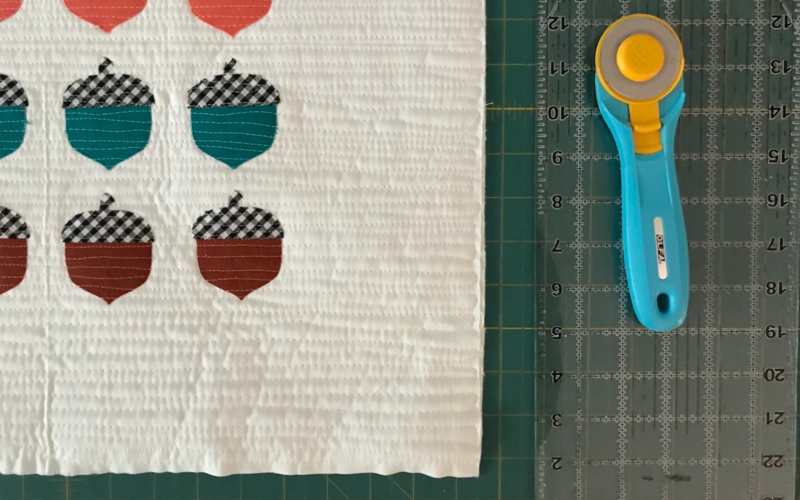 Make four copies of the acorn bottom and arrange them in the top left 5-inch section of the cutting mat. 3. Using the drop-down menu of the Send panel, choose “Fabric, Thin (Cotton Print)” as your material type. Change your blade depth to five (and adjust your blade accordingly if you’re not using an AutoBlade). 4. 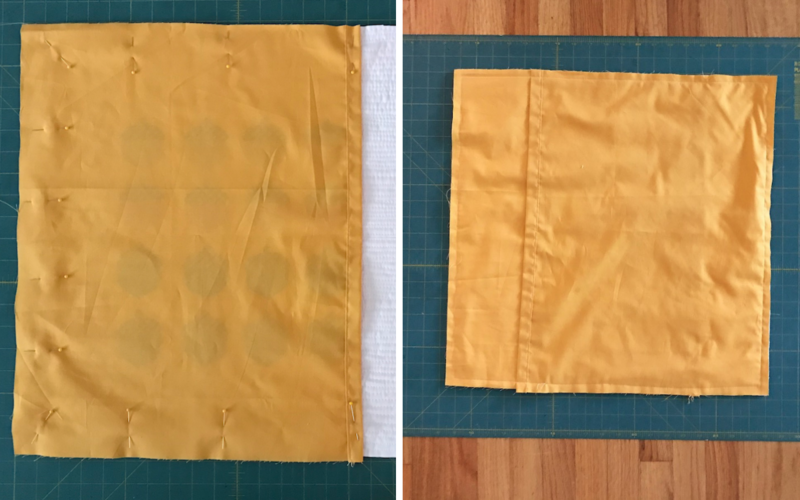 Place one square of the fabric you are using to cut the bottoms of the acorns on the upper left corner of your mat with the fabric facing up and the fusible fabric stabilizer side on the sticky part of the mat. 5. 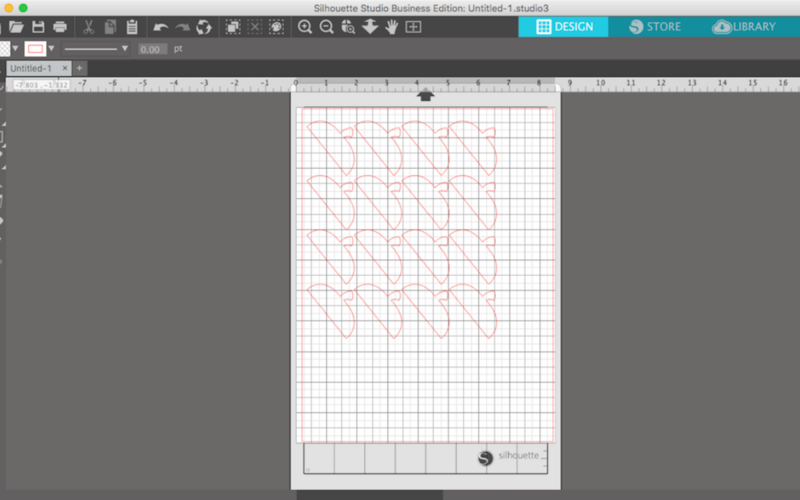 Load the cutting mat into your cutting machine and click Send in Silhouette Studio® to cut the design. 6. Carefully peel the fabric off of the mat. 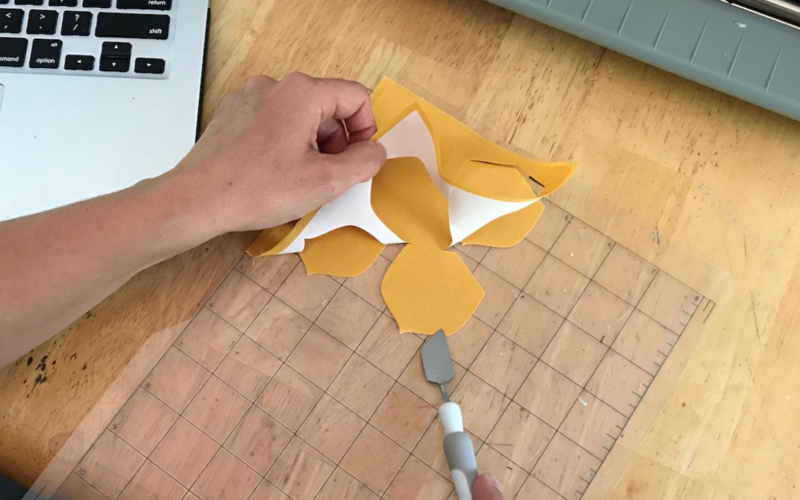 The paper backing may pull off of the fabric as you do this. Make sure to scrape clean any paper that has stuck to your mat. 7. Repeat the above steps for each color you are using for the bottom of your acorn. 8. Delete the acorn bottoms from the design page and drag the acorn top to the top left corner of the design page. 9. 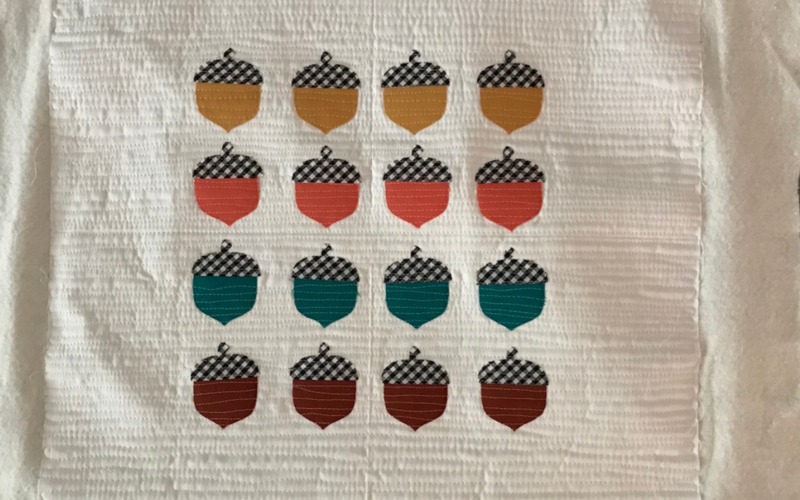 I wanted my gingham print on the fabric to lay diagonal, so I rotated my acorn tops 45 degrees. To do this, select the acorn top and use the green circle to rotate. You can also select the top, go to the Transform panel, and select 45° under the Rotate By section. 10. 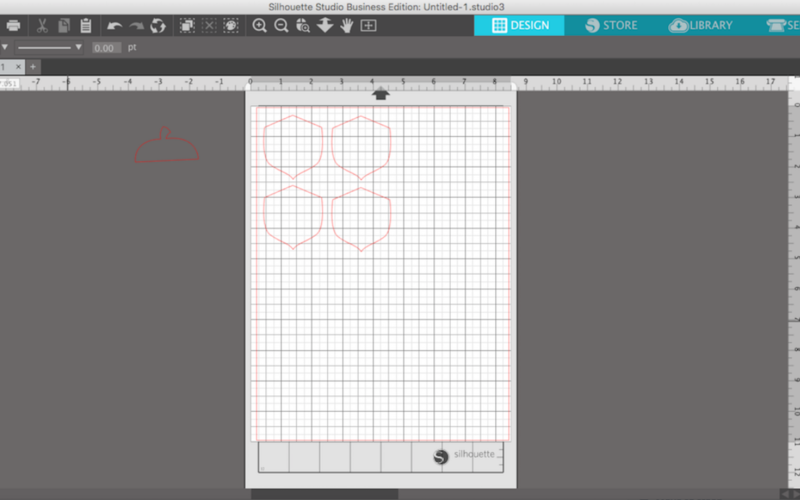 Go the Replicate panel and make 16 copies of the acorn top. 11. 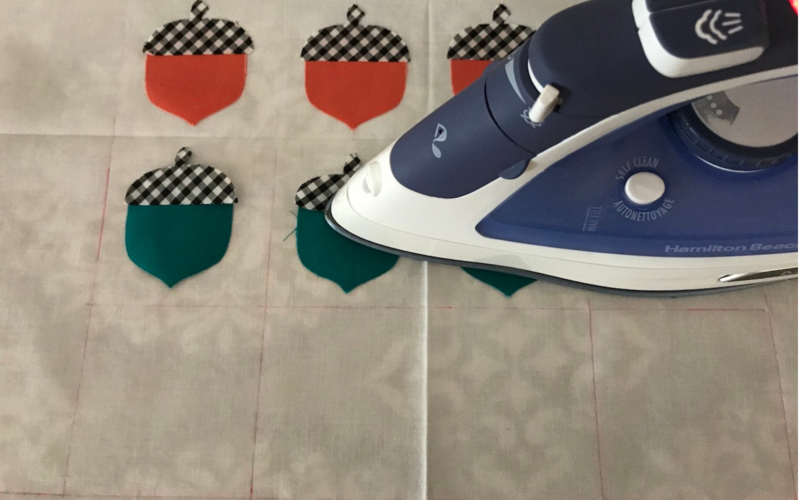 Load the fabric onto your cutting mat and use the same cut settings that we used with the acorn bottoms. Then proceed to cut out the acorn tops. 1. We are going to mark the 20-inch piece of fabric for the pillow top with a grid. This will serve as a guide for laying out the acorns. 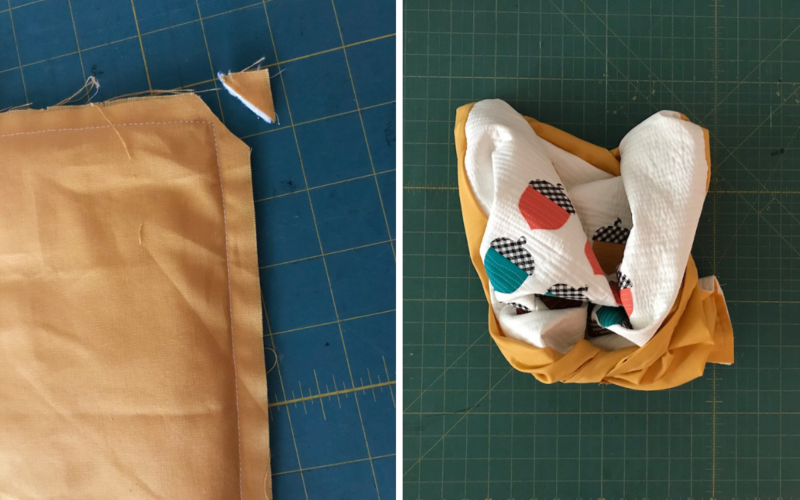 Start by folding your square of fabric in half horizontally and then vertically, making a square one quarter of the original size. 2. Iron the square making center creases for guidelines. 3. 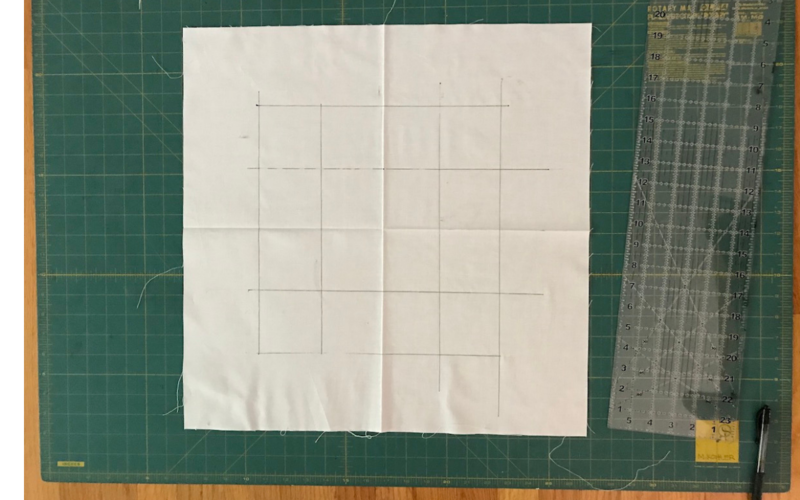 Now we will mark a 3-inch grid using the creases as the center starting point. I am using my cutting ruler and a pink FriXion pen. 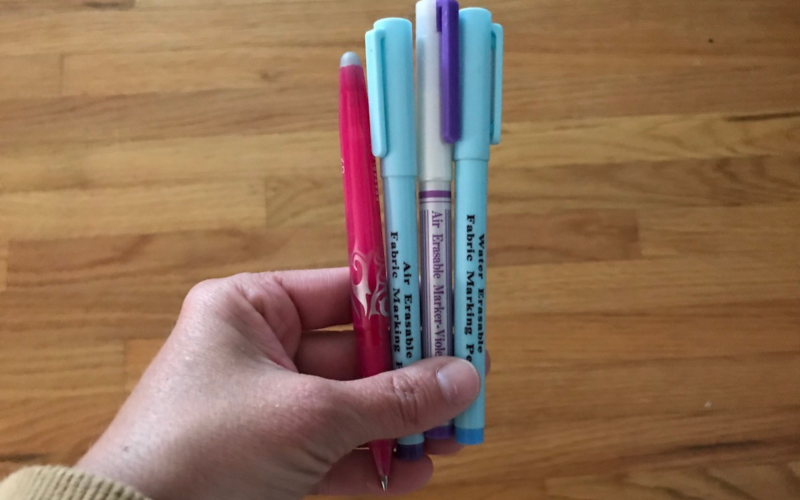 You may also use an air or water soluable marker. I used a regular black marker in the photos so you could clearly see the lines. 4. Mark two lines 3 inches and 6 inches above the center seam you pressed previously. Repeat the steps by marking lines 3 inches and 6 inches below the center crease. 5. Now mark lines vertically from the center crease at 3 inches and 6 inches on either side. You should have a grid with 12 squares. 1. Remove the paper backing from your acorn pieces. Center one acorn bottom and one acorn top in each marked square. 2. Iron the acorn pieces to the pillow. I started with the top row and moved to the bottom, making sure not to erase the lines on the next row as I went. 3. Remember to follow the manufacturer’s directions for your fusible fabric stabilizer. 4. Make a quilt sandwich with your pillow top and batting. You could use muslin here also as a backing, but I find that just the batting works fine. 5. Quilt organic straight lines about 1/8 inches horizontally across the pillow top making sure to catch the edges of the acorn fabric. Alternately, you could hand or machine applique the acorn pieces at this point if desired. 6. Trim the batting from the pillow top leaving a 20-inch square. 1. On each pillow back piece, fold over one 20-inch edge and iron a 1-inch hem. 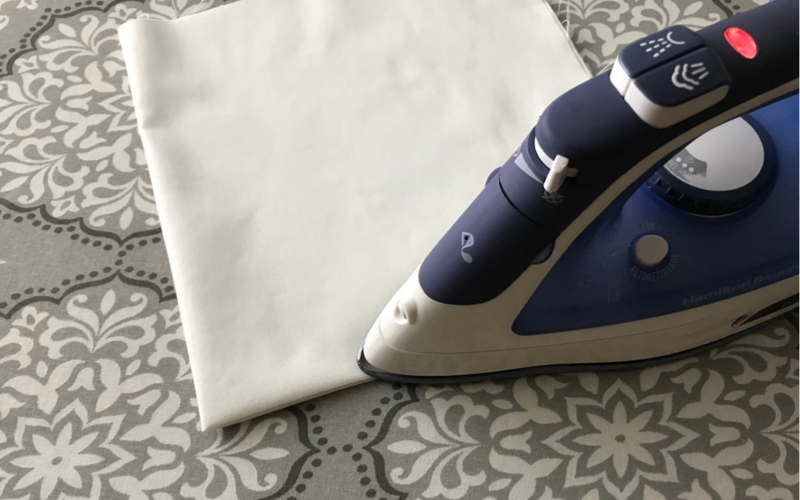 Fold over and iron again to create a double hem with no raw edges. 2. Sew a seam about 1/8 inch from the top of the hem. 3. Lay the pillow top face up. Pin one pillow back in place, lining up the raw edges and with the hem near the center. Pin the other pillow back to the other side. 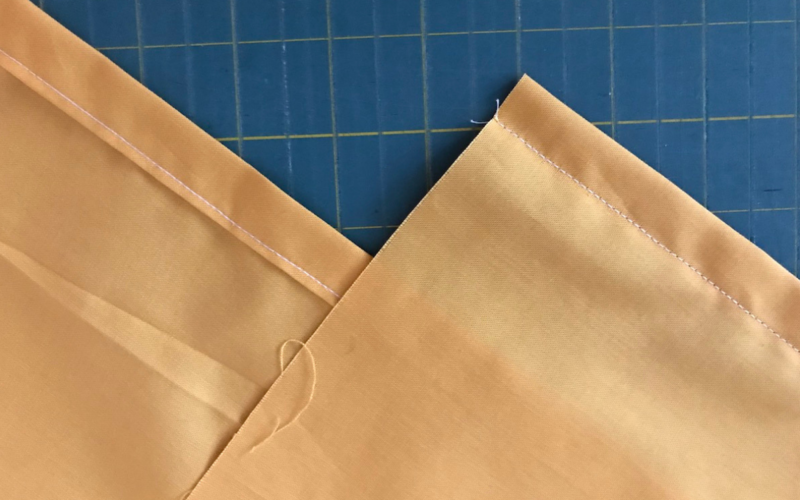 The hemmed edges should overlap making an envelope closure. 4. Sew around all four sides using a 1/2-inch seam allowance. 5. Trim your corners and turn right side out. 6. Press the seams for a finished look. Hooray! It’s a great feeling to finish a project! 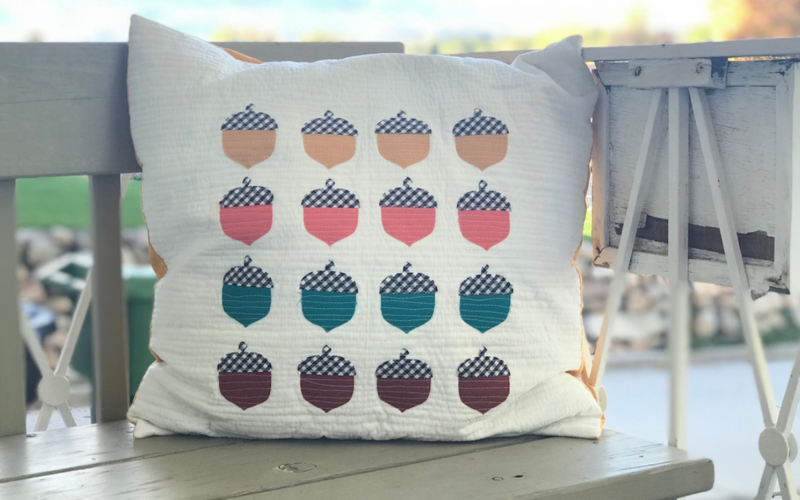 Let me know in the comments below how your pillow cover turns out!